The huge "number meadow" teach children the numbers from 0 to 100. In the small flowerbeds, flowers can be industriously planted, picked and symmetrically mirrored. The number goblin "What a muddle" and number fairy "Forget me not" accompany children on their first steps into the world of addition and subtraction, as well as recognition and naming of numbers and quantities. Short introduction stories help children remember what they've learned. 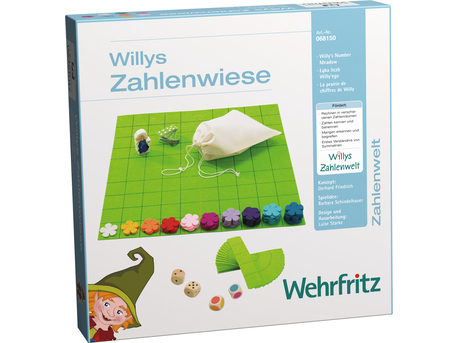 Includes instruction booklet with lots of game ideas. Material: felt and wood. Dimensions: number meadow 55 x 55 cm, printed on both sides, flower beds 27.5 x 5.5 cm, printed. Includes storage bag.